Belt conveyor is one of the most fundamental equipment among wide range of bulk material handling equipment used to transport bulk materials mechanically. It is the most viable option for conveying material over long distances. It is used to convey dry bulk materials horizontally or on inclined. 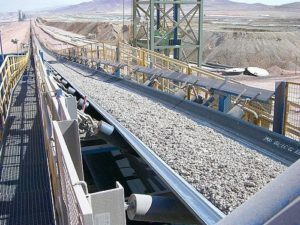 The maximum inclination angle to which a belt conveyor can convey the material depends on characteristics of the bulk material being conveyed. For conveying dry bulk material, belt conveyor is troughed one with varying degree of troughing possible based on the capacity to be achieved and the type of belt used. Various types of belts can be used for Belt Conveyor depending on the application. For steeper inclined conveying cleated belts are useful. AEGIS manufactures Belt Conveyors with varying length and width and other customizations depending on the application and characteristics of the material being handled. Some of the customized features include: single / double side walkways, GI/FRP hoods, screw/gravity take up, scrappers, magnetic separators, trippers, feed skirts, etc. Belt Conveyors by AEGIS come with assured quality and competitive prices giving best value for your investments. AEGIS always works with its clients to identify the right solution to transport the bulk materials quickly, safely and efficiently from one location to another.